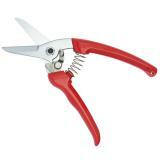 Serrated clippers playing to rave reviews. Flockmaster did 30 sheep with a single pair. Awesome! 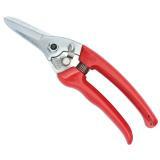 best hand trimmers ever! 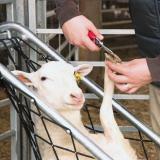 have used on old rams ewes goats and lambs. Wow! 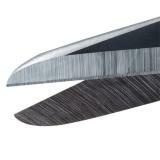 These work like a sharm for my husband (finally a pair of clippers that cut! )But my teenage daughter dislikes them prefering the ones her dad doesn't like...it's one of those things that you kinda have to try to see if you like them. I bought these trimmers assuming that I was buying the top of the line tool. I'm sure that the materials are of very high quality, and the blades are very sharp. But I was disappointed in two aspects of the construction: first, the safety catch does not stay securely in place; a slight bump of the trimmers causes the catch to release and the trimmers to pop open. Second, the rounded tips cross over each other just a bit. 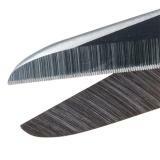 This means that when you use the trimmers to clean a hoof, both sharp tips are slightly exposed. Perhaps my pair were made when the quality control person had a bad day. I'm sure they will last much longer than any cheap farm store trimmers, but considering the price, I'm not sure I'd recommend them.